Danielle has been a Patient Care Coordinator at Welcome Smiles for 2 years. She received her degree from Pace University and after leaving New York in 2010, found that she was drawn to work in a dental office. 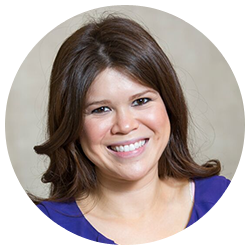 She strives to make patients comfortable and to change their perspective on dental care. She wants every patient to have an experience free of fear, and filled with comfort. When Danielle isn’t at the office, she can be found running, going to the mountains with her husband, or laughing at her French Bulldogs, Lexi and Scooter.